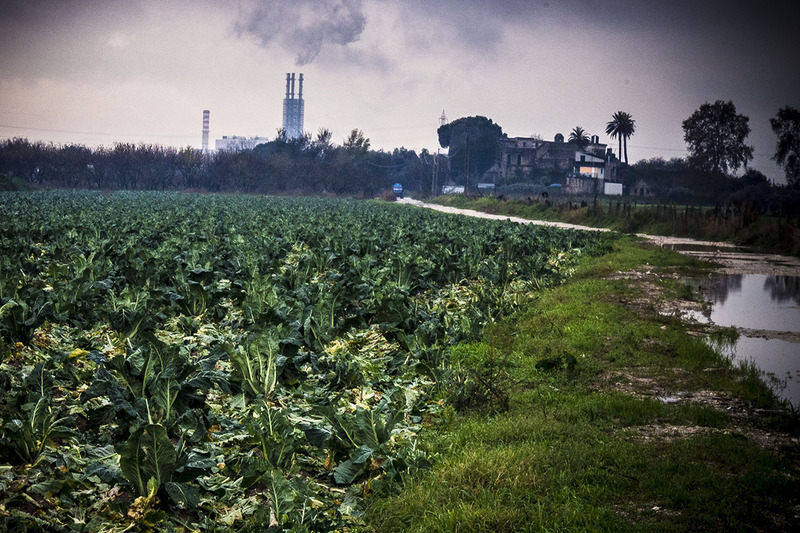 The polluted fields of the Campania region in Southern Italy are infamous as the outcomes of two decades of urban and industrial waste mismanagement. There, struggles for environmental justice are also struggles for reclaiming dignity. Acerra, Giugliano, Chiaiano. In this order, on December 14 2014, a delegation of international researchers, journalists and activists have met and discussed with local communities that are fighting for environmental, social and political justice. In the territories around the city of Napoli, these communities are struggling against an imposed and long-lasting contamination process that has unfolded during more than 20 years of the so-called “waste emergency” in Campania. Since the 1980s, the contamination of Campania’s territories has been caused by the illegal trade and disposal of hazardous waste perpetrated by Camorra—the Neapolitan mafia organisation—that dumped around 600,000 tonnes of industrial and toxic waste per year over the last 20 years with the complicity of industrial companies and the State. The tour has been organised by the Italian environmental NGO A Sud, as part of the week of training on the interface between academia and activism carried out within the Entitle project. The first stop was in Acerra, where we met the local activists outside the gates of the waste incinerator towering over their territory, which has a capacity to burn 600,000 tonnes of waste per year. The highly contested plant is managed by the Northern Italian company A2A, and it was built between 2004 and 2009 by the FIBE corporation, following a tender issued by the Commissioner to address the waste emergency in Campania. Since 2009 the facility has been burning garbage bypassing both environmental impact assessments and local communities’ participation in decision-making process. The tour continued to Giugliano, in the northern periphery of Naples. There, we were introduced to the history of the Resit landfill and stood in awe in front of the Taverna del Re waste-blocks storage site. 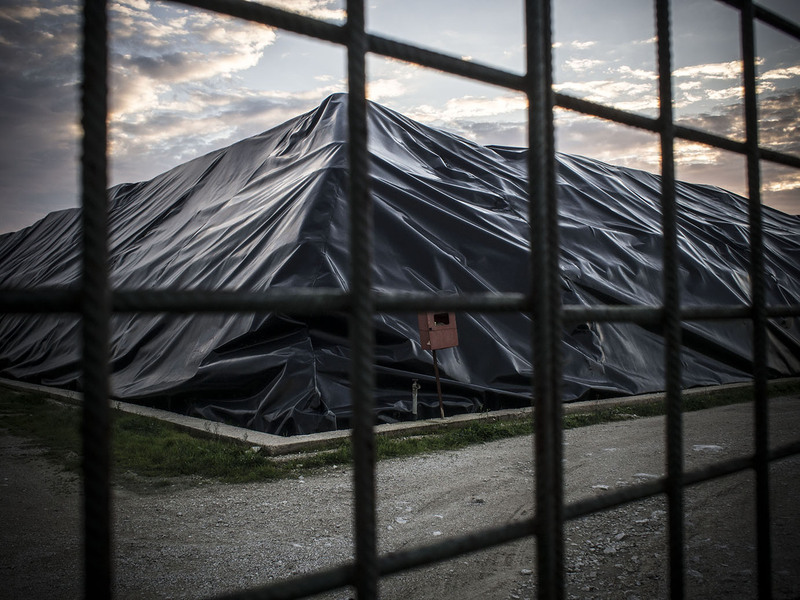 Since the 1980s, and until mid-90s, a company utilised by Camorra (Ecology 89) has been running the Resit landfill in illegal ways: by dumping all sorts of hazardous and toxic waste it turned the area into an “ecological bomb”. To present day, it continues to produce leachate and biogas that affect the surrounding agricultural productions and the local communities. 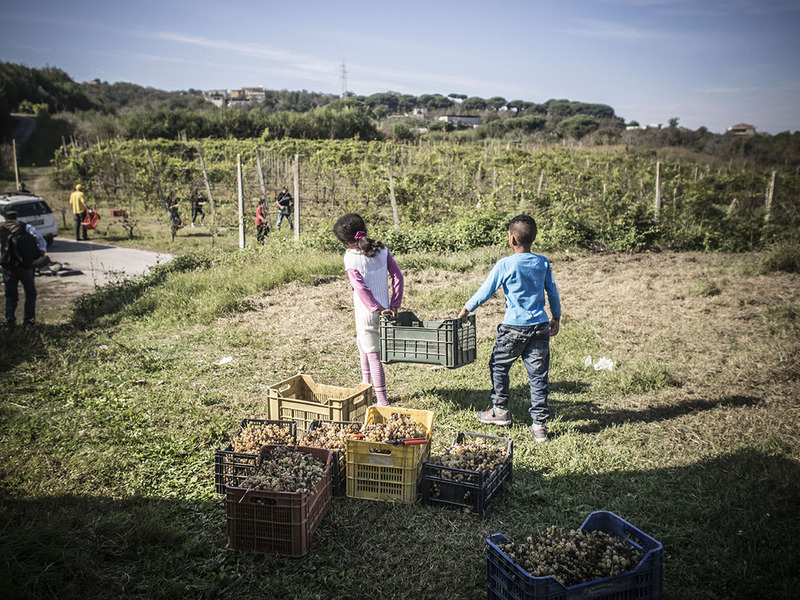 Not least, this is affecting a Roma community of 60 families, men, women and numerous children, settled by the Giugliano municipality at the border of the landfill, amid social and economic disastrous conditions caused by the environmental hazard of the landfill. Taverna del Re is the next stop of the tour and the size of the globally known pyramids of waste is impressive, disruptive, and distressful for all of us, both locals and “outsiders”. The first feeling to arise is helplessness: the site has been proposed by some as the mausoleum of shame and human greediness. In Taverna del Re, a storage site of waste expands in an area of about 130 hectares, where 6 million tonnes of waste blocks sit and continue to produce leachate. The waste stored in Taverna del Re should have been there only temporarily, until the opening and functioning of the incinerator. Nonetheless, it still stands in the same area after almost ten years since the opening of the site, because there is uncertainty on the quality and typology of materials for incineration collected in the waste blocks. Both facilities exist on territories of thriving agricultural production. The activists we met informed us on the ongoing struggles for land remediation, as well as on their historical grievances in terms of the lack of inclusion in decision-making processes. Endemic health concerns related to the uncertainties on the type of waste that has been dumped and stored in such areas are coupled with the lack or inadequacy of responses from local, regional and national authorities. The last stop of the tour has been Chiaiano. A peripheral neighbourhood north of the city of Napoli, Chiaiano, with its famous woods, is one of the last remaining green lungs of the city. Historically, it has been an excavation site for construction materials. Today the landscape is scattered and defined by the massive quarries that were chosen in 2008, by the Commissioner for the waste emergency, as sites of waste disposal during the peak of the waste crisis. Local committees, activists and the community at large, have fought against this project, in a struggle that has not yet managed to prevent the disposal of waste. It has, however, created a network of strong and diverse political activism that today goes under the name of Stop Biocidio. Surprisingly, the tour ended in a somehow hopeful way. In Chiaiano, we visited a green, luscious vineyard where local activists produce wine and fruit on a land confiscated to Camorra. The wider project is one of urban agriculture that employs youth in need of professional rehabilitation after periods of detention. Their practice is encouraging: in place of waste dumping and undemocratic top-down decisions over their territory, the local communities decide, act and produce a solid and participative alternative to a geography of sacrifice and contamination. One of the things that struck us all was the constant presence of the police at the gates of each facility we visited. Mostly men, standing in silence in their gear; the same military force employed by the Italian and other neoliberal governments to impose a shock doctrine over those who dare to resist. The day was long and my head felt heavy. It has been over one year now that I have been working on my master thesis on a case study over the urban political ecology and the environmental injustices that occurred in Pianura. Pianura is a working-class neighbourhood at the western periphery of Napoli, where the most violent urban resistance took place as a response to the top-down decision to re-open the historical Pisani landfill during the 2007/2008 peak of the waste emergency in Campania. It has been one year now that I study the social and environmental injustice ongoing in the region and that I actively try, through academia and in society at large, to place the Biocide of Campania within a wider network of communities in sacrifice zones all over the world, acting and reacting to neoliberal and criminal processes of accumulation by contamination of local territories, bodies and histories. I am not new to the devastated territories and powerful stories of my hometown like most of the team of Entitle. However, at the end of that day I felt I had very little to say, even less to hear. I was tired and, just like any other time I drive around and see the Campania (in)felix landscape I need time to metabolise the smells, the sights, the eyes and the stories of those who fight to resist. As a young researcher, I was told many times that scientific and academic work must be “not emotional” and supported by reproducible data. It is an enormous struggle to step away from emotions and situatedness when researching on something so close to you. Something that arose from the Biocide Tour, however, is crucial to whoever investigates environmental conflicts in the field of political ecology. People make an identity as they make a living. Communities resist and rise up against hegemonic powers and build collective institutions, redistribute benefits and risks and struggle to maintain their dignity. Local actions provide alternative visions of politics and decision-making processes. By accepting or refusing “on their own terms” some forms of modernisation, communities present an active face that challenges the homogenisation and exploiting forces of globalisation. * Ilenia Iengo is an activist and a master’s student of International Environmental Studies at the Norwegian University of Life Sciences (NMBU), in Ås, Norway.